The free space technology has existed for many years. The first demonstration of transmission of radio wave through the air was in 1887 by Heinrich Rudolf Hertz and since then wireless communication has advanced to new heights. The Retro Radio remains unique, in its own class; it picks up transmission clearly, utter words, but it cannot receive a response from its listener. I love reading stories of God’s action, guidance and commands in the Holy Bible. In this piece, I will share a strategy of war as it was reveal to King Hezekiah when Judah was under siege by a known terrorist of that time – Sennacherib King of Assyria. Communication is an act or a process of giving information, and often one-way. Whereas a conversation involves the exchange of information between 2 or more people. And so when the King of Assyria sent his field commander to threaten Judah and ridicule the Lord of Host, King Hezekiah commanded the people to remain silent, not a word was exchanged with the enemy. You see, when trouble comes like a flood, when the unexpected, the unplanned happens though we remember our vulnerability, but to whom do we turn? The carnal nature of man desires to flex its muscle on such occasions. Some of the immediate responses are finding someone else to blame, covering the truth rather than exposing it, speaking negative words, dancing to the beat of the enemy forgetting he has only one objective – to kill, steal and destroy. The enemy of our soul is an expert in painting a picture of defeat through words. In battle, learn not to engage him, do not answer him, rather go to the Lord in prayer. King of Assyria harassed the people of God with many words, “who gives you confidence?”, “who do you depend on?”, “who do you take counsel from?” and “how will you be delivered?”. Words to intimidate, disarm, influence and inflict fear. Are there any situations speaking these words to you today? 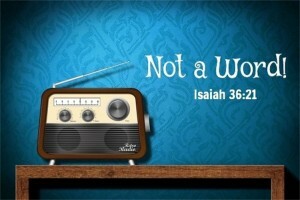 Remember the acts of God in Isaiah 36 & 37. Do not answer him! Speak not a word to engage the enemy. Go to the Lord, His arms are wide open to carry and protect us through the storm. Prayer: My Lord, there is nobody, no trouble greater than you. You are God enthroned in heaven, you are awesome in battle and mighty in deliverance. In your faithfulness, you remember those who love you and you bring justice to the oppressed. You are my shield and the lifter of my head in trouble. Because of you I am not consumed. Thank you for the power you have released, and I have received. I will be still in the place of battle, for you to fight and vindicate me. I decree in the name of Jesus that my life will remain a chronicle of victories won by you and for you. May all the glory, honour and power be yours now and forevermore. Amen.